Oregonians are a lucky bunch—creating America’s first tiny hotel on wheels, fashioning bicycle parts to ride old rails. They’re plotting a trail across the desert, launching world premieres on the stage and promoting travel by water or on gravel from one end of the state to the other. New farm tours are popping up faster than a wild morel after a spring rain. So what are you waiting for? Get out there and try one of 1859’s ten new ways to experience Oregon. The quiet hum of human voices pedaling along a decommissioned section of the Wallowa Union Railroad, historically called the Joseph Branch, has largely replaced the whistles and screeches of trains lumbering through Wallowa Valley. Cycling enthusiasts Anita and Kim Metlen of Imbler (near La Grande) have created a distinctive touring experience in Eastern Oregon. 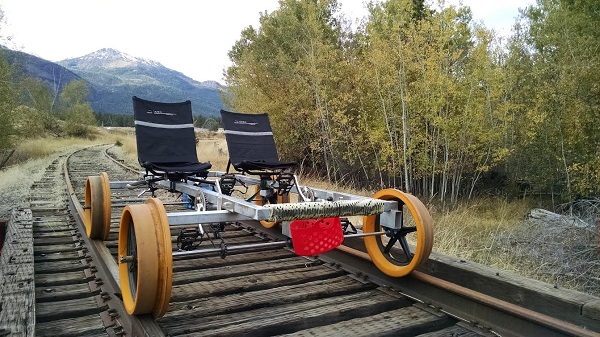 Riders can sit side-by-side on a recumbent bike specially built, modified and tested by Kim to slide on four wheels along the rails. Founded in 2014, Joseph Branch Railriders (jbrailriders.com) offers twelve bike units to accommodate up to twenty-four people on each trip. Susan Roberts of Enterprise was one of the first customers to take the twelve-mile roundtrip between Joseph and Enterprise, and rode with her 20-year-old grandson. Roberts’ family members who also rode the rails told her it was the most fun in six miles they’d ever had. Cyclists can pedal at their own pace or with a group, but to avoid collisions, the units clump up and turn around together in Enterprise. The first half of the trip has a 1.5 percent decline so pedaling is easy; returning requires a bit of effort. Those needing some help can get it from a motorized unit. Trips depart from Joseph at 9 a.m., noon and 3 p.m., Friday, Saturday and Sunday between May and October. More cycling units and a second line from Minam to Wallowa, a four- to six-hour trip, are planned for 2015. 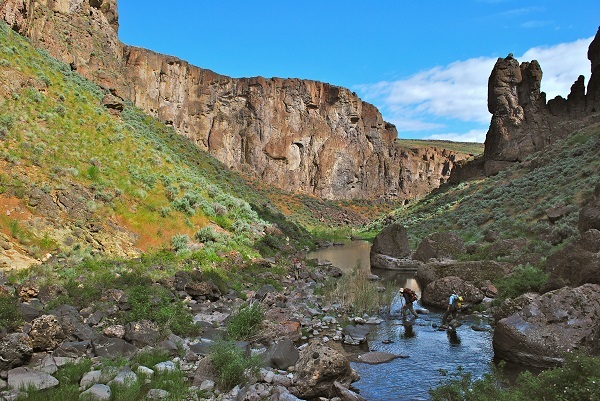 Eight-hundred miles of the Oregon Desert Trail, stretching from Bend to Owyhee State Park near the Idaho border, await your exploration. But don’t bother going to Yelp or Tripadvisor—you won’t find a lot of information there, according to Heidi Hegemeier of the Oregon Natural Desert Association (ONDA). The trail is remote, has spotty or no cell service, challenging terrain and rough roads. In short, it’s perfect for adventurous souls wanting to unplug. The best place to go for information is ONDA, which has surveyed the entire trail. Its website, onda.org, offers maps and navigational tips, trail descriptions, and places to eat and sleep. 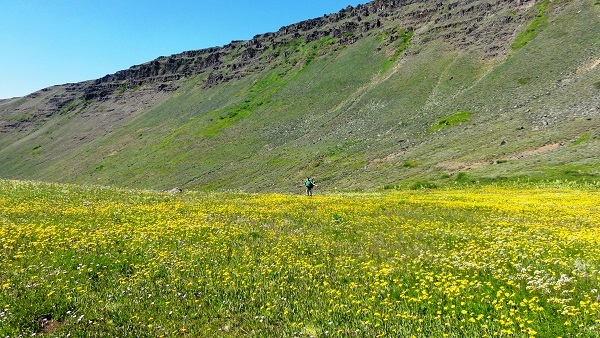 A hiker pauses for a photo-op in a field of wild flowers in the Steens Mountain Wilderness along the Oregon desert Trail. Winter is one of the best times of year to visit the high desert, according to Brent Fenty, ONDA’s executive director. Three of his favorite sections include the Alvord Desert near Steens Mountain, the Badlands (east of Bend) and Leslie Gulch in the Owyhees. 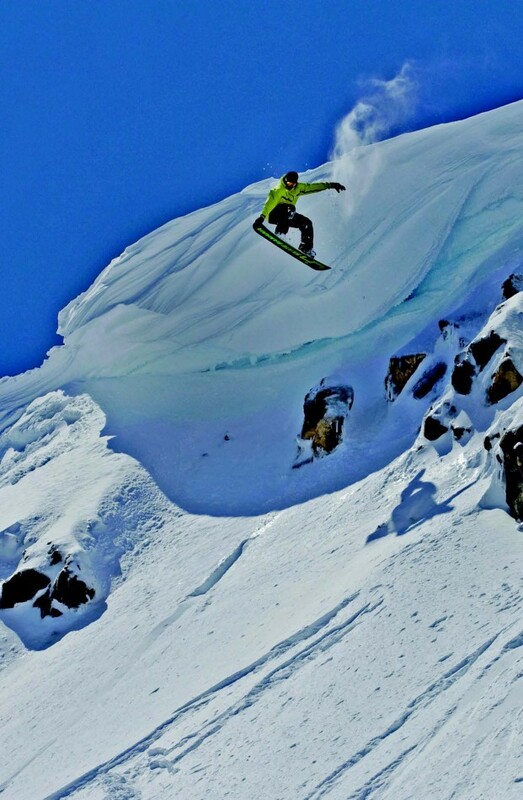 “The Alvord offers one of the most awe-inspiring vistas in Oregon,” he said. “You can look up at Steens Mountain, which juts about 6,000 feet above the Alvord, is the largest fault block mountain in North America and features contrasting ecosystems.” He also loves the old growth junipers of the Badlands. “It’s a landscape of subtleties and forces hikers like me to slow down,” he added. With its prominent hoods, spires, arches and honeycomb rocks, Leslie Gulch is a place where hikers can’t believe that they’re still in the state of Oregon, he said. Why not hike the Oregon Desert Trail in Oregon-based, Oregon-made footwear by Keen? Try the Keen Durand Mid WP ($180) hiking boot. This new-style boot is available for men and women, and is waterproof, breathable and shock-absorbing—perfect for winter hiking in the desert. A Smith Rock rarely seen awaits experienced hikers and mountain bikers on the new Summit Trail, which departs from the well-trodden paths around the rock climbing mecca in Central Oregon. With more than a half-million visitors annually, finding solitude can be as rare as a parking spot on a weekend. The eight-mile trail that skews to the park’s north end and crosses about 1,000 feet of private property of Ranch at the Canyons is strenuous but not technical, according to Matt Davey, state park ranger. It offers a more secluded, nature-focused experience, he said. The view of Smith Rock on the way to the park’s new Summit Trail. Davey recommends doing the hike counter-clockwise to get the steep mile section along Burma Road over with early. 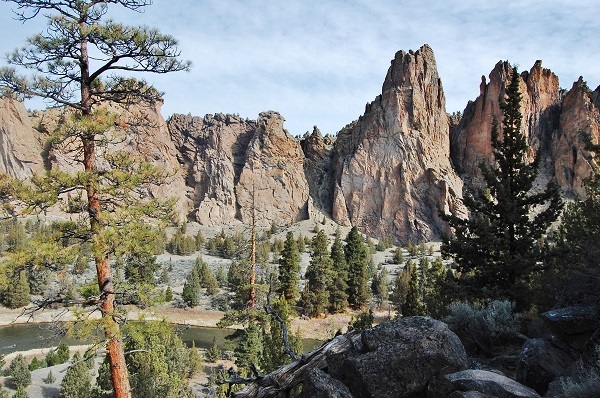 Once on the Summit Trail, it’s a gradual descent with sweeping views of the Crooked River National Grassland—a primary hunting ground for golden eagles and an awesome view looking south into the park. The new loop is open to mountain bikers, bringing a fresh dynamic to the park, Davey said. When other Central Oregon trails are packed with snow, Smith Rock and nearby Gray Butte Trailhead offer clear trail systems almost every day of the year. 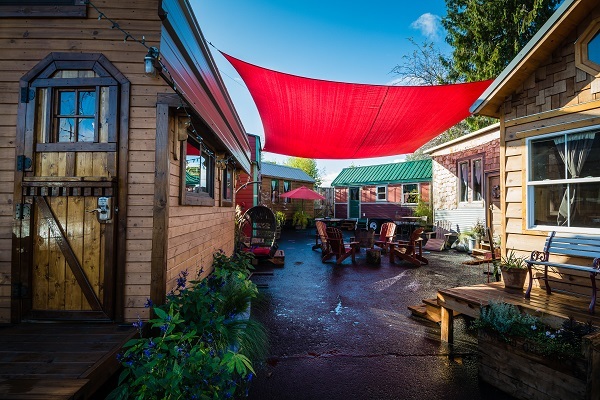 Strange thoughts and senses swirl in your head as you step inside the grounds of Caravan—the Tiny House Hotel in the heart of Portland’s Alberta arts district. Six custom-built tiny houses on trailers and wheels encircle a central area with a metal fire pit, Adirondack chairs, flower pots, hammocks and a big red overhead canvas. Outside the decoratively carved metal doors, onlookers press their faces against the gate to draw the attention of owners Deb Delman and Kol Peterson. They want to know about Caravan’s next tour and open house. The pair has become cause célèbre in tiny living. Caravan offers a tiny but equipped lodging experience in one of Portland’s most vibrant neighborhoods. “We’re providing the only public platform to try out tiny houses,” said Delman. The Caravan is the first of its kind in the United States, drawing international media attention and requiring innovative city permits to allow overnight accommodations. Opened in July 2013, the hotel was an instant hit and has been at near full occupancy since then. The units, with names like The Caboose, Roly Poly, and Kangablue, have flushing toilets, showers and all the amenities of home packed into 100 to 200 square feet. Each sleeps from two to four people and comes with fair trade products, travel books, bird sounds at the press of a button, handmade quilts and umbrellas (of course). Guests can even order room service from Radio Room across the street or dine at The Grilled Cheese Grill, where the food is full size. When trails are muddy, nights are dark and you just don’t feel like going out, a book is good company. Pick up a book by an Oregon author or about Oregon. Deschutes County librarians suggested several good reads. 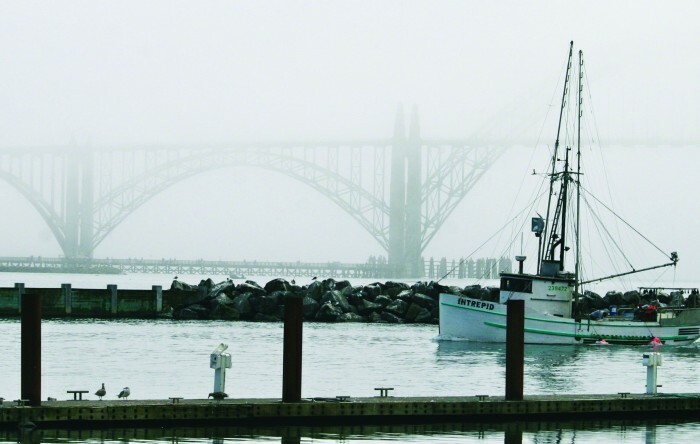 The Plover by Portland humorist, poet, journalist and fiction writer, Brian Doyle, is about the adventures (and misadventures) of Declan O’Donnell who sails from Oregon intending to be alone but picks up an odd assortment of passengers. Amazon says it’s a “rapturous, heartfelt celebration of life’s surprising paths, planned and unplanned” and contains a boatload of Doyle’s signature wit and whimsicality. Fans of Portland author Chelsea Cain’s six best-selling novels about the twisted relationship between a Portland detective and serial murderer will want to pick up her latest mystery thriller, One Kick. The plot revolves around 21-year-old Kick Lannigan, a kidnapping survivor who gets pulled back into her past when two children in the Portland area go missing. For a young-adult-appropriate read (Cain’s books are not), Bend-resident April Genevieve Tucholke’s second book, Between the Spark and the Burn, was released this past summer as a sequel to Between the Devil and the Deep Blue Sea, both literary gothic thrillers about a young woman, Violet, and a troubled and mysterious young man, River. The Residue Years, an autobiography by Mitchell S. Jackson, is a gritty story of a black man growing up in Portland in the ’90s. Crack cocaine-induced mayhem on black families in one of America’s whitest cities. If you haven’t seen a play in Ashland recently, 2015 would be a great year to go. The eightieth season of the Oregon Shakespeare festival envisions two musicals, including Guys and Dolls, three world premieres and a contemporary Chinese comedy. The world premiere of the musical Head Over Heels brings to stage a script by Oregon native, Jeff Whitty, who also wrote the Broadway hit, Avenue Q. Another first performance, Fingersmith, adapted from the novel by Booker Prize nominee Sarah Waters, is a “good, creepy, Victorian thriller with a love story and amazing plot twists,” said Amy Richard, a spokeswoman for the festival. The third world premiere, Sweat, by Lynn Nottage, explores America’s industrial decline in the 1990s and redemption in the new century. Mrs. Whatsit (left, Judith-Marie Bergan) and Mrs. Who (K.T. 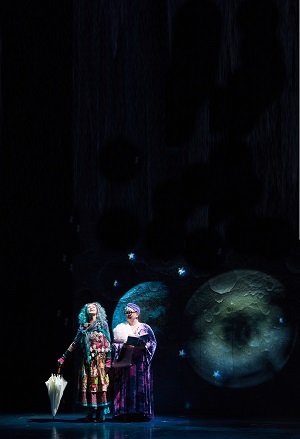 Vogt) contemplate the universe in the 2014 production of A Wrinkle of Time. One of the most popular plays in China and Taiwan, Secret Love in Peach Blossom Land, debuts for the first time in America. The storyline intertwines a classic Chinese fable with the modern tale of a couple separated in the wake of the 1949 Chinese Revolution. And if nothing less than Shakespeare or an American classic will do, then this year’s line-up won’t disappoint with Much Ado About Nothing, Pericles, Antony and Cleopatra and Long Day’s Journey into Night. One of the best ways to squeeze more from your trip is to buy a ticket to the “preface,” a thirty-minute introduction to plays in the outdoor Elizabethan Theatre, or stick around after a matinee performance for a free, post-show discussion with a cast member. For details on which plays offer a preface or post-show discussion, go to osfashland.org. Step off the shore, give your kayak, canoe or drift boat a little shove and start paddling the Willamette Water Trail. You’ve got miles and miles of serenity, verdant shoreline and songbirds ahead. One of fourteen designated American Heritage Rivers, the Willamette River flows northward 187 miles from Eugene to the Columbia River and runs through the most populated section of Oregon. 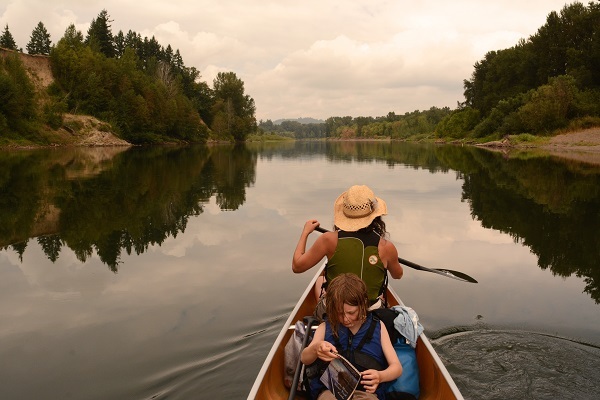 The water trail consists of the river and adjacent lands, giving paddlers access to boat ramps, campsites and natural areas, such as the Willamette Greenway sites. Public and private groups in the mid-Willamette Valley initiated the thirty-five-mile upper section of the water trail in 2004. Since then, a partnership of stakeholders along the river, led by Willamette Riverkeeper and Oregon State Parks and Recreation, have extended the water trail north to the Columbia. A family paddles the tame Willamette River. Hop on the river for an afternoon or take a multiday camping trip. Two printed guides—one for the upper and another for the lower section—along with a website help people to navigate the river safely and find pertinent details. Travis Williams, executive director of Willamette Riverkeeper and author of the Willamette River Field Guide, said the water trail is very approachable and is generally navigable year-round. Two of his favorite spots are Sam Daws Landing and Willamette Mission State Park, both big and undeveloped. Take binoculars for a close up of bald eagles, river otters, beavers, bobcats and deer. A new movement to explore Oregon’s remote regions on gravel-capable bicycles is gaining traction: gravel routes. 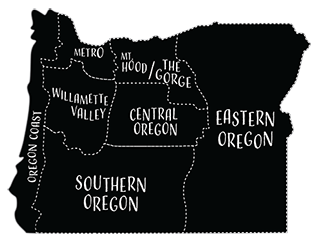 Ride Oregon now lists six challenging trails on lightly traveled gravel roads and dirt paths, with distances from forty-seven to 364 miles across the entire state. Many feature beautiful views, waterfalls, historical sites, wildlife, wide open spaces and hot springs. Mountain and gravel-biking guru, Gabriel Amadeus of Limberlost, advised people not to be deterred when considering a gravel ride. “People get scared or think they’ll be miserable or that they don’t have the right bike,” he said. “But for me, these routes mean fewer cars and traffic.” He and Donnie Kolb of Velodirt have ride-tested all the routes on the website, including the Oregon Outback, which starts in Klamath Falls and ends at the Washington border. Amadeus said they’re planning to add “mellower half-day rides” to the website. 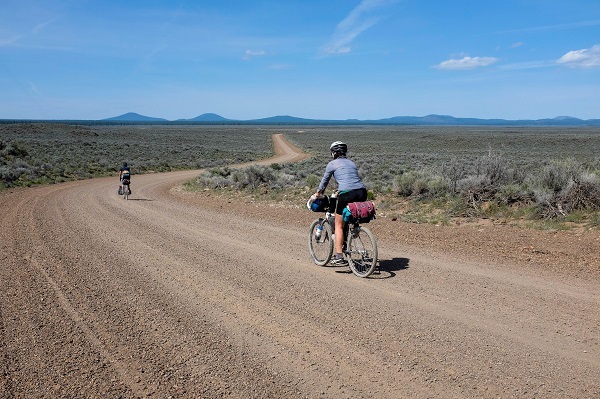 Bicyclists tour one of Oregon’s amazing gravelways. Cyclists who prefer to buy local can check out gravel bikes by Ti Cycles, a Portland company that hand-builds bikes to customers’ specifications. 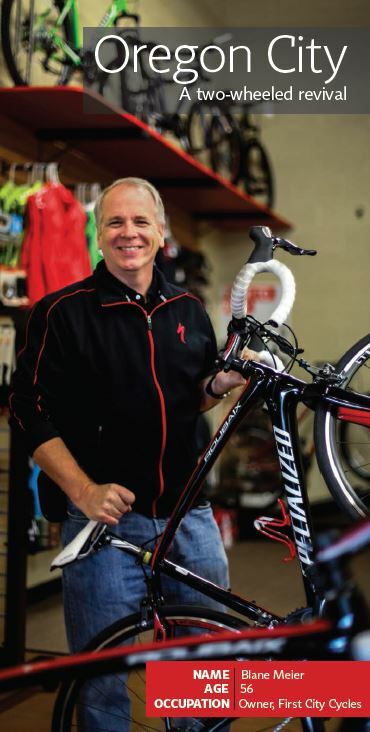 Ti Cycles’ clientele consists of bicyclists of all skill levels seeking high quality bikes in both steel and titanium. “For off-the-shelf adventure bikes, our go-to and gravel-specific bike is the REN Waypoint,” said Eric Herboth, operations manager. The specs include titanium frame in five sizes, robust tubing and 66 millimeters of tire clearance. If you’ve ever had a kid ask, “What’s that apple doing in that tree?” it’s time to head to the nearest farm. “There’s a disconnect between the public and farming,” said Mary Stewart, director of the Oregon Farm Loop. The farm loop exists to educate the public about farming and increase the profitability of family-owned farms, she said. Visitors can take a self-guided driving tour through Farmlandia’s scenic network of more than fourteen farms, produce stands, you-pick fields and Bob’s Red Mill World Headquarters with its nearby whole grain retail store. 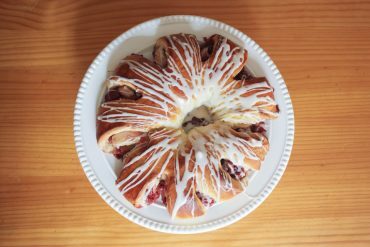 The Farmlandia Loop joins two others in Clackamas County: Molalla Country Farm Loop and Canby Area Farm Loop. The best time to visit is between June and October when crops are growing, but not all farms are open every day. Stewart advises checking websites or calling ahead before you go. 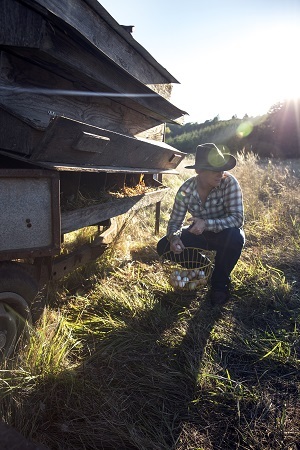 An Oregon farmer collects a day’s share of fresh eggs. While you’re at it, learn to prepare a four-course meal from chef Jessica Hansen at the Kitchen at Middleground Farms near Wilsonville. The cooking school is located in an old cattle barn, remodeled into a state-of-the-art kitchen and stocked with farm-fresh veggies and eggs, as well as dairy products from Nubian goats. Or indulge in a dinner that brings together chefs, farmers, and guests to enjoy a seven-course meal made with seasonal ingredients produced at the host farm, paired with offerings from nearby wineries and farms. Chef Pascal Chureau of Field & Vine Events will prepare the first of fifteen “Dinners in the Field” on April 25 at Rosse Posse Acres Elk Ranch in Molalla. Other farms and chefs, including Our Table Cooperative, will offer specialty dinners throughout the growing season. Itching for solitude? Picture it—you, your bike and seventy miles of a low-traffic roadway along the Breitenbush River and nationally designated Wild and Scenic Clackamas River. Hot springs, river canyons, mountain views, and steep and windy climbs keep the ride interesting. Follow Highway 224 out of Estacada and finish in Detroit on Highway 24 (closed some months due to snow). “You find amazing places on a bike, like little swimming holes, that you’d never see from the car,” said Nastassja Pace of Travel Oregon, which partners with Oregon State Parks and Recreation on Oregon Scenic Bikeways. The new bikeway is challenging because there are no services once a cyclist leaves Estacada, she said. Riders, nevertheless, can find camping at either end and along the route. Cascading Rivers Scenic Bikeway joins eleven other scenic bikeways in Oregon—the only state with such a program. From the early 70's to the early 80's I serviced fire extinguishers all over Eastern Oregon. I visited a lot of out of the way locations, visited museums, enjoyed community events, read roadside markers. I am so glad that I took the foresight and time to do all of those things. I still promote visits to Eastern and Central Oregon. …..sweet……can't wait to ride the rails…..that is GORGEOUS country !! !